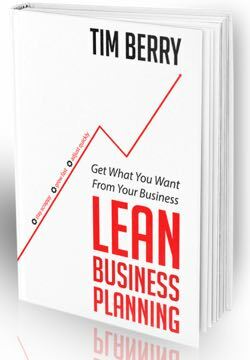 Lean business planning distinguishes between the lean plan you maintain all the time and the formal business plan that some businesses need on special occasions only. I refer to the phrase “business plan event” as some business development that requires you to show a business plan to somebody. The most common business plan events relate to getting investments or business loans. Both of these business events require presenting a business plan to somebody outside your company. Other less obvious business plan events are triggered by divorce, death, opening a merchant account, bringing in partners, selling the business, and so forth. In investment, don’t get fooled by people who say investors don’t read business plans. I can’t speak for all, but I can speak from my experience in working with venture capital and as an angel investor: investors will reject some businesses without reading the plan because they can tell, from the pitch or the summary memo, that they don’t want to go further and won’t even want to see the plan. But — and this is important — every investor I actually know and have worked with (about 60) will either read the plan or have somebody they trust read the plan, and thoroughly, before agreeing to invest. In investment, we call the process of investigating a startup “due diligence.” And it includes poring over a business plan. And what happens with banks and commercial loans, in my experience, is that having a business plan doesn’t guarantee you’ll get the loan, but not having one, especially before you know the bank well, can guarantee that you won’t. Don’t do the extra work of the full formal business plan unless you have a business plan event scheduled. Keep your lean plan up to date. When you run into the event, then you go from your lean plan, that lives on your computer and isn’t polished or edited for outsiders, to a formal business plan tailored for the specific business need. For example, that formal version of your plan that you send to investors ought to have good descriptions of management backgrounds and exit strategy. And the one you send to the bank has more on the personal assets of the owners, payment history, and ability to cover the interest expense. Neither of these formal versions is in your lean plan: your lean plan stays alive and flexible on your computer and gets reviewed and revised each month. Both the formal versions are outputs from your plan, intended to serve some specific business need.